The Wairuna, a steamer en route from Auckland to San Francisco, was captured by the German raider SMS Wolf and later sunk near the Kermadec Islands. The crew of 42 was taken prisoner. The Union Steam Ship Company’s Wairuna (3947 tons) was passing the Kermadec Islands (these lie 800–1000 km north-east of the North Island) when a seaplane flew overhead and dropped a weighted canvas bag on the forecastle head. Inside was a note ordering the steamer not to use its wireless and to surrender to the nearby German commerce raider Wolf − or face attack. When the seaplane dropped a bomb 20 m in front of his ship, the Wairuna’s captain had little choice but to comply, especially as the powerfully armed Wolf was now approaching. 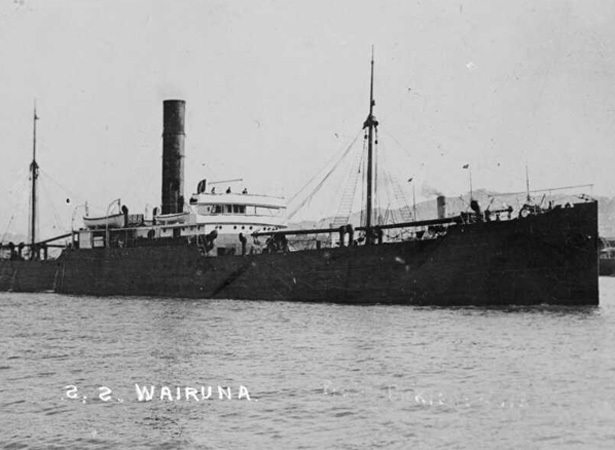 On 17 June, after its 42 crew members, cargo of live sheep, 900 tons of coal and other provisions had been transferred to the Wolf, the Wairuna was sunk by scuttling charges and shelling. An American schooner, the Winslow, which stumbled upon the scene was also seized and sunk, its 15 crew joining the New Zealand prisoners. Some of the Wairuna’s crew suffered greatly in captivity in Germany before they were freed at the end of the war. We have 19 biographies, 40 articles, related to New Zealand steamer captured by the Wolf.